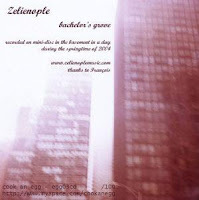 Chicago-based Zelienople have been around for over 10 years, and in that time have become staples in the underground music architecture. They have released records on many labels, including Digitalis, Type, Under the Spire and Root Strata. Singer/guitar player Matt Christensen releases solo work as Western Automatic, and records with Type Records founder John Twells. Percussionist Mike Weis performs and records frequently with alt-folk legend Scott Tuma; Weis, Tuma and Christensen form the band Good Stuff House. Multi-instrumentalist Brian Harding releases solo work under the moniker Ill Professor. The band has forged its most essential work to date with Give It Up—a record which succeeds as a perfect summation of their progress in the last few years. Zelienople is currently recording a new album with their newest member, keyboardist and singer Dan Mohr (G L E A M I N G/DRMWPN, et. al.). They will release a number of recordings in the coming year.